A sea of tranquility, foggy foothills... this soft and peaceful stone crafted by Mother Nature captures her most calming colors in a miniature "painting" as unique as the wearer. 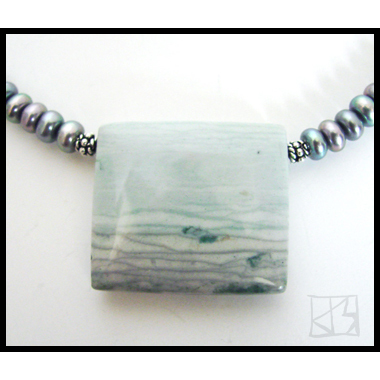 This rectangular pendant (30mm x 22mm x 8mm) is cut from polychrome jasper. Its natural layering evokes undulating waters, rolling hills, tidal dunes with the ocean and sky beyond. However one interprets the natural patterning, what is undeniable is the peace and serenity it offers the eye. To preserve this sensation, I've chosen silvery peacock pearls, natural rondelles with iridescent lavenders and blues that enhance the pendant's hues. 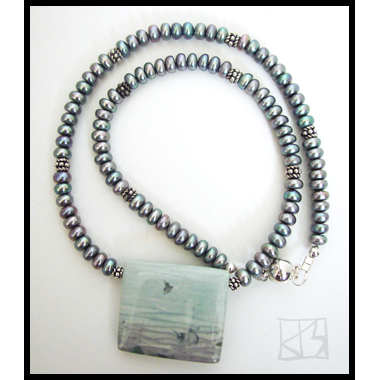 Bali silver beads accent these pearls, and the piece is finished with an easy magnetic clasp, also in sterling silver.